Some sort of mold or fungus? 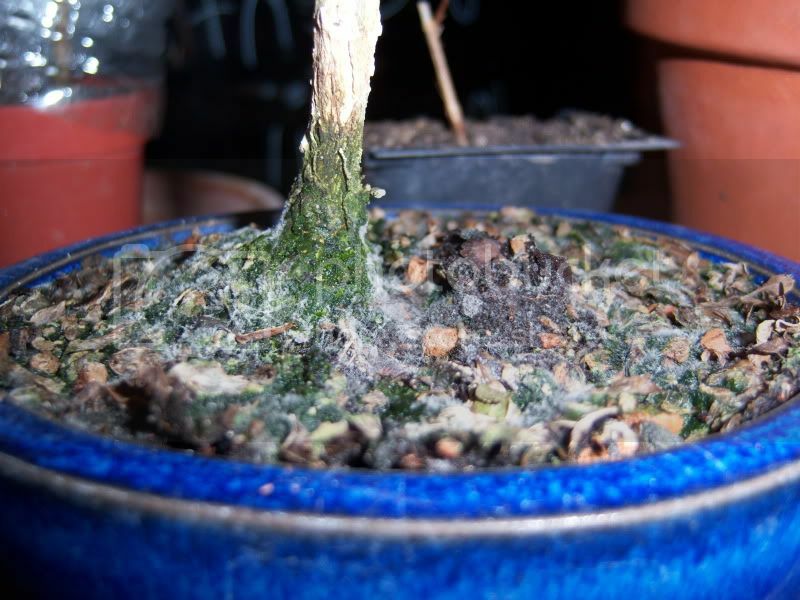 I've got some sort of white fuzzy mold or fungus growing on the top of the soil of my tropical bonsai trees. First picture is my Serissa that just came from Meehan's Miniatures last week. I watered it last night, and this morning I noticed that some of the whatever it is was growing on the soil. Another is a terra cotta pot that contains a Schefflera, and the what ever it is is in better view due to the contrast between colors. 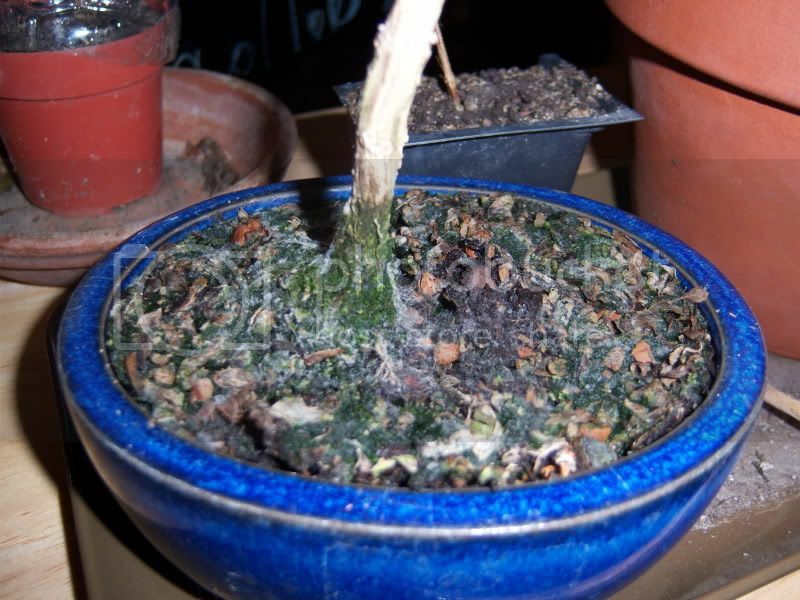 It is also on the soil of a different Schefflera plant. So, can anyone tell me what it might be and how I can treat it? I would like to not have to repot the two with it on the soil, but if that is the only treatment, so be it. Do you have anything circulating the air in the room. I keep a ceiling fan going around the clock for just that purpose. No I don't. The plants are on a shelf in a southern facing window in my bedroom. Would a small fan help prevent something like this from happening again after this problem is cleared up? it happens to mine sometimes and is apparently of no harm to your trees. I think is associated with too much watering or high humidity. Let the pots dry out moreso between waterings. I noticed this can happen if the soil is to moisture retaining. If you want to, you could try to use a soil that dries out faster. Looks, from your pics. like you have a mix of organic/inorganic soil in the pots. Does it drain well? You shouldn't have to wait very long to see water coming from the bottom when you water them. Good air circulation is a must for indoor culture, IMO. I use a ceiling fan in my plant room all day in order to keep what you've got happening from happening. I have to water and mist more frequently because of the fan but it's just part of the give and take in my view. I'm even thinking of getting an oscillating fan to help move air between pots and branches. I would consider it if you keep your plant's humidity level fairly high......or even if you don't. The Serissa was not potted by me personally, but I think it has a small covering of moss or something on the top with bonsai soil underneath. It drains well. My Scheffleras are planted in sharp sand and some potting soil seeing as they are no where near where I would like them to be yet. I would have to figure out a way to circulate the air without making it colder for me at night (unless it is only on during the day?). Alright, the fan that I ordered has arrived. I rigged it up near my plants pointing slightly upwards (not an oscillating fan sadly). 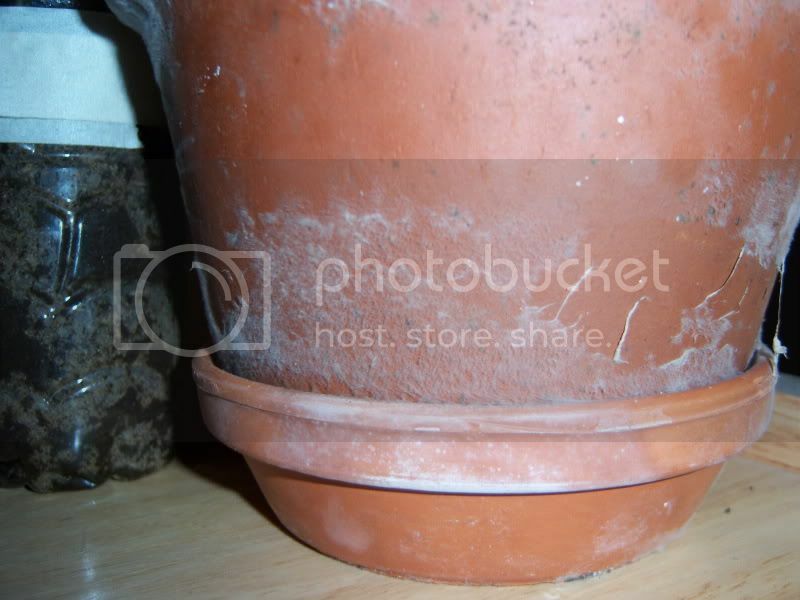 I cleaned off the terra cotta pot of whatever it was. The only thing that really has any of the mold left is the Serissa potting mix. EDIT: Cool, the white fuzzy stuff has disappeared from the soil of the Serissa a day after the fan was rigged up.